Personnel – Mike Rodriguez, Nathan Eklund, Alex Sipiagin, Josh Deutsch: trumpet/flugelhorn; Roman Filiu, Michael Thomas, Peter Apfelbaum, Joel Fraham, Chris Cheek: reeds; Tim Albright, Alan Ferber, Jacob Garchik: trombone; Jeff Nelson: bass trombone; Manuel Valera: paino; Ricky Rodriguez: bass; Roberto Quintero: percussion; Dafnis Prieto: drums + Guests – Brian Lynch: trumpet; Henry Threadgill: alto sax; Steve Coleman: alto sax. Although I’m not a staunch fan of Latin jazz, there are a few records that stand out, whether due to its bold arrangements, vivid harmonic colors, or distinctive contagious rhythms and energy. 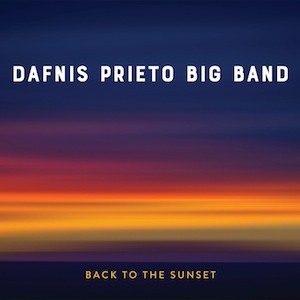 This is the case of Back To The Sunset, a kaleidoscopic big band record by Cuban-born drummer Dafnis Prieto, who employs a roster of reed titans and rhythm experts to shape up nine original compositions, each of them dedicated to influential mentors/musicians. “Una Vez Mas” punches up the verve with strong horn figures and a rousing rhythm. A pure Latin allure comes from typical piano movements, while the soloists - pianist Manuel Valera and guest trumpeter Brian Lynch - offer up much of their instinct musicality, both melodically and rhythmically. After their discourses, Prieto and percussionist Roberto Quintero make the temperature rise with a conjoint percussive feast. “The Sooner The Better”, dedicated to Egberto Gismonti and Jerry Gonzalez, boasts a piano pedal while Ricky Rodriguez expresses thoughts on the double bass. After that, the bassist ensures the pedal, and discernible rhythmic shifts precede wholehearted improvisations by Peter Apfelbaum on tenor, Alex Sipiagin on flugelhorn, and Roman Filiu on alto. The soloists’ atonal diversions reflect the brilliance of their language. Saxophonist Chris Cheek, groovin' on the baritone here, introduces “Out of the Bone”, a piece whose improvisational section is inclined to the low tonal range due to acts from Jeff Nelson on bass trombone, as well as trombonists Alan Ferber and Jacob Garchik, who duel with pertinacity. The most grandiose moment of the record comes with the title track, coinciding with the second guest appearance. Acclaimed alto saxophonist Henry Threadgill kills it with a sensitive, sharp solo, beautifully developed outside the standard patterns while driving this ballad into his own musical realms. The tune was dedicated to him and genial pianist Andrew Hill. The third and last guest musician is M-base pioneer Steve Coleman, who, not as edgy as in his musical odysseys, plays his alto with competence on “Song For Chico”, a tribute to Chico O’Farrill, Arturo O’Farrill, and Maria Bauzá. “Danzomish Potpourri” kicks in with Prieto’s distinctive drumming. A pleasurable melodicism drives us to a rampant, feverish pulse that only lasts throughout Michael Thomas’ busy improvisation on soprano. The primary pace, far more relaxed, is re-established to expose Valera’s dreamy ideas and Apfelbaum’s tearful melodica sounds, which bring the song to a conclusion in a 3/4 meter signature. Authoritative individualities emerge from “The Triumphant Journey”, where juxtaposed horn layers dance under the spell of a 6/8 time signature that suddenly mutates to a slower 4/4 to serve as a receptacle for the improvisations. The vernacular elasticity of saxist Joel Frahm stands out, together with Filiu, who finalizes with magnetic appeal. Encompassing the worlds of Latin and jazz music, this 75-minute fusion tour is full-blooded and predominantly spirited.